General Assembly and new website! Yesterday the Society met for its annual General Assembly (GA). The GA approved the Society's accounts for 2012 with unanimous vote and elected a new Executive Committee for 2013. The new Committee members are presented below. For more information on the matters discussed during the GA, the minutes will soon be made available online. Before ending this year we have very good news for you: along with our facebook group, CUPortSS has now a brand new website! In our new web page you can find all sorts of information about the Society, the Committe, all our events (including photos!) and much more! This will be the last newsletter of the current year. On the behalf of the outgoing Committee I would like to thank you all for coming to our events! You were absolutely essential in making all this year's events a huge success and in giving all of us the opportunity to have a lot of fun and learn a bit about the culture of Portuguese speaking countries! For us it has been a great pleasure to organize the Society's activities. We wish the new Committee all the luck in the world and we are sure next year will be at least as good and the this one! For now I would like to wish you all a great Christmas and a happy New Year! We will be back in January with a renewed team but with the same enthusiasm to organize a lot of great events in 2013! We are getting close to the end of our year, and it is therefore time to the annual General Assembly, to which you are all invited. The General Assembly (GA) will take place in the Graduate Union, on the 4th of December at 8pm. 1) Presentation of a summary of the current year's expenses to date. 2) Enquiries about the current year's accounts and events. If you want to be involved and present a Motion for the new Committee, the call for Election Motions is now open until the 2nd of December. On the 3rd of December we will announce all the Motions running for election on the GA. According to the CUPortSS constitution, the three Principal Officer positions shall be filled by members of the society that must be members of the University of Cambridge. At least TWO of the Principal Officers must also be current full time students of the University. Candidates for Principal Officers shall submit their Election Motion to the CUPortSS Secretary (cuportss@gmail.com), consisting on their list of proposed candidates to the Executive Committee together with a Plan of Activities. Any other positions can be included in the Election Motion - such as Sports Officer, Ents Officer, Cultural officer, etc. If you need any clarification, contact the CUPortSS Sectretary (José Reis) at cuportss@gmail.com. The most wonderful time of the year is arriving! In Portugal, this is a magic time for reflection, rejoice, and family and friends gathering. It is also the time of the year when mouthwatering sun-and-salt-dried cod delicacies are eaten. 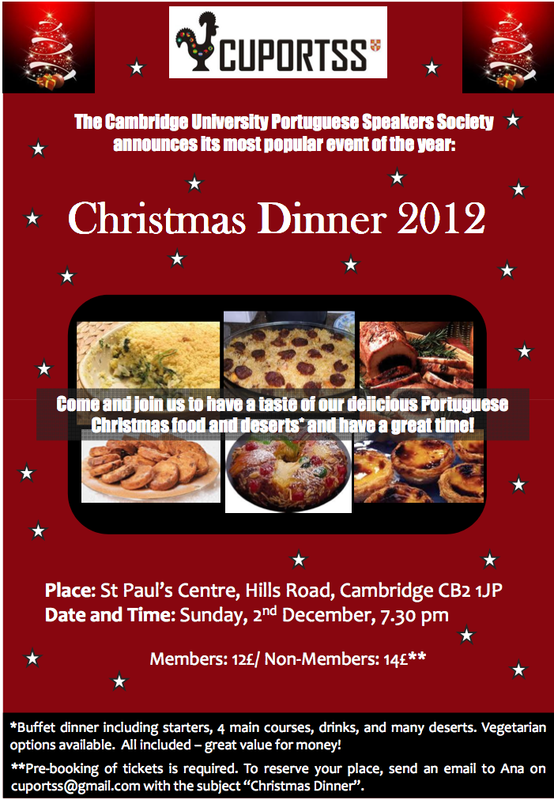 If you would like to get a taste of the Portuguese Christmas traditions, come and join us in our very popular Christmas dinner on the 2nd of December in the St Paul’s Centre, from 7.30pm to 11pm. 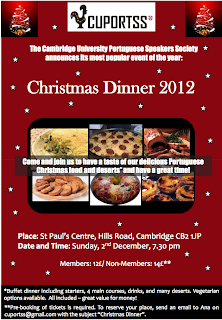 deserts, and drinks will be served. Vegetarian options are also available. Places are limited and you will have to buy your ticket in advance. Magusto is a celebration of the land, the legend of Saint-Martin, chestnuts on the fire, liquors and rich wines! A cultural celebration, carried out by many generations that very often used beautiful moustaches. Join us and enjoy real Portuguese chestnuts from the region of Trás-os-Montes, the very traditional ‘jerupiga’ liquor, many other Portuguese snacks and wines and, of course, a warm evening! Bring your moustache (either natural or synthetic!). Classic Portuguese music from the 90s will make it impossible to say no to a dance! Preferred Dress Code: 1990's style and a Moustache!